In January of 2014, the frightened grandmother of unborn twins Emily Grace and Avery Lynn Binns messaged Ride to Give asking for help. Her grand-babies were around 30 week gestation and in distress. Their parents Samantha and Michael were told at their 27 week appointment that Emily had a birth defect call CDH-Congenital Diaphragmatic Hernia and they needed to find a doctor at a hospital 45 minutes from home where there was a Level IV NICU. At 28 weeks they met with a team of doctors in Fairfax, VA who did more in-depth testing and discovered that Emily's defect was very large and referred them to the Children's Hospital of Philadelphia Special Delivery Unit which is almost 4 hours from their Virginia home. At 29 weeks, Samantha and Michael traveled to Philadelphia for 2 full days of prenatal testing. Afterward they sat in a tiny room where they were told their daughter Emily had a 3% chance of survival at birth and a 50% chance that she would not survive to her first birthday. The team at CHOP asked the Binns to relocate to Philadelphia at 32 weeks and remain there until the twins could be safely delivered at 37 weeks. They returned to Virginia and began to prepare for Samantha to relocate alone because Michael would now be the sole provider (a special education teacher) and would need to stay home to care for their older children, Alexander, 7 and Savannah, 2. At 31 weeks Samantha went to her local Doctor's office to pick up paperwork and was sent straight to the local hospital… She was in active labor! After several hours attempting to stop labor so that she could be flown to Philadelphia, the girls were not waiting. Samantha had an emergency c-section that night. Right before she was wheeled in, the doctor on call, whom they had never met, stopped to pray with them. She also asked if they would like to have someone in the OR to baptize Emily as she likely would not survive delivery. Avery came out crying and was rushed to the NICU. A few minutes later Emily was born blue and limp. She did not make a noise. The team worked on her for a long time, trying to intubate her. A nurse printed off the hospital ID bands for the babies and Avery got hers, however Emily's was set aside as they do not place them on babies that are born “sleeping.” After a very long time they were able to intubate Emily and get her to the NICU where she would start a very very long journey. At 17 days old Emily was stable enough to transport and was flown to CHOP for the remainder of her care. Emily would go on to spend just under 300 days of her first year in the hospital. After completing a 45 day NICU stay, Avery was discharged and joined Samantha in Philadelphia where she was with Emily. Avery had a subsequent 10 day stay for what was believed to be a small stroke that affected her ability to feed properly, and came home with an NG tube for 3 months. Doctors do not know what caused Emily to have CDH. The defect typically develops between 8-12 weeks gestation but there is currently no known cause. It is now believed that Emily has some form of genetic abnormality that they are doing more testing for. Emily has had surgeries to repair her CDH, G Tube placement, GJ Placement, Perforated Bowel, 2 Ladds Procedures, 2 sets of ear tubes placed, and her Cleft Palate repaired. It has been rough road for Emily however Avery is currently hitting all her milestones and no longer requires a feeding tube or therapy. Emily's current diagnosis include FTT, GERD, G Tube dependent, Feeding Intolerance, Severe Oral Aversion, Chronic Lung Disease, Pulmonary Hypertension, ASD, VSD, Sleep Apnea, Gross Motor Delays, Hypotonia, and suspected genetic & neurological abnormalities. She also has severe speech delays. Emily's main struggle is her feeding issues. She is continuing to lose weight and was already very small; not even reaching 0% on the growth charts. Emily has weekly weight checks at her pediatrician and bi monthly trips to CHOP. She has a sleep study scheduled in October to gain more information about her sleep apnea. She also sees her Pulmonologist bi monthly in Virginia and will begin receiving RSV shots next month in advance of the winter cold and flu season. Due to her Chronic Lung Disease, they must be super vigilant about her respiratory status. A simple cold could very easily hospitalize her and even take her life. Her immunity is compromised as well. Because of her feeding difficulties, she is also at risk for aspiration & aspiration pneumonia. She has labs and consults pending with Neurology, Endocrinology, & Genetics as well. Thankfully, Emily does not need to see Cardiology until February for her next Echo & EKG. Currently, Emily requires all her feedings via her G Tube and feeding pump, she uses an oxygen machine overnight and portable oxygen as needed during the day. She uses a pulse ox monitor all night and spot checks during the day. She also has a nebulizer and suction machine as needed. Emily current receives PT, OT, & feeding therapy once a week. She is on the waiting list for a second day of PT each week as well as a speech therapist. Her parents had been told that Emily would be caught up to her peers by her 2nd birthday in February, however earlier this month they were told that Emily may never catch up to her peers as doctors are still unsure what all Emily is facing. In the next few months the Binns hope to have Emily's wheelchair as well as a stander and special bed delivered. Unfortunately the cost of the wheelchair and other equipment for Emily is not fully covered under insurance and the cost of all the travel to Philadelphia is adding up. With only Michael working, it is tight keeping it all together. They are behind on a few of their bills, playing the “who gets paid first” game each month. All they want to do is what is best for their children and help Emily thrive. We want to help too. Please donate here and help us purchase Emily's wheelchair and stander, pay for multiple trips to and from Phily, and help pay deductibles and past due medical bills. Please folllow Emily on Facebook here. 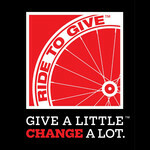 Contributions are solicited with the understanding that the donee organization (Ride to Give) has complete discretion and control over the use of all donated funds. Questions about how your donation is used can be answered by clicking here.